I have often talked about “cyber psyop” or cyber influence. The notion of using traditional techniques in the cyber medium. The NY Times on July 22, 2014 ran an article on July 22, 2104, It’s Another Perfect Day in Tibet! (see: http://www.nytimes.com/2014/07/22/world/asia/trending-attractive-people-sharing-upbeat-news-about-tibet-.html?_r=0, which is also the photo source). The article talks about the Chinese competent Twitter poster, Tom Hugo (That's Tom's picture above.) Seems Tom is actually a figment, he’s not real, but his Twitter pages are real – real good examples of how PSYOP can be used in cyber space. Tom and many of his colleagues are the progeny of the PRC’s propaganda machine designed to shape he news in the way the PRC government feels the news ought to look like. The bogus sites were found by a “Free Tibet” group. While there is no direct evidence that the government of the PRC is behind the efforts, most experts concede it would be difficult to point out any others who would benefit from tis type of campaign. The people in these social media efforts are generally commercial images. Tom Hugo for example is a Brazilian model. Like their PSYOP counterparts in other times and places, there are no MOE on the PRC efforts. The PRC may have banned Twitter, FaceBook and YouTube in their own country, but it is apparent they recognize how important these social media sites can be for influence purposes. It would not be a giant leap to see this kind of influence operations extended to Military Deception (MilDec) operations where details of future deployments, or unit readiness are ‘leaked’ via social media postings. Hopefully all y’all are enjoying your summer. On a travel note, I had a chance to visit the Disney Family Museum at the Presidio of San Francisco and enjoyed it. Here are a couple of Walt’s efforts in WWII. These photos were taken by the author. One of the unique facets of PSYOP is that it can be employed at all organization levels from strategic to tactical. Nowhere is this more evident that the Middle East. While one could probably argue that there was more than a little early Middle Eastern PSYOP involving a snake, an apple and a garden – there is no doubt that PSYOP is a key element of conflicts in the Middle East. At the Strategic level, heads of state take steps they know will not directly effect their adversaries, but would position them more favorably in the court of world opinion. One such PSYACT took place when Israel unilaterally accepted the short-lived “Truce” announced early this week brokered through Egypt. Israel announced that they would abide by the truce knowing that Hamas couldn’t go along with the truce without losing face among its own people and appearing to be weak in dealing with its enemy. Given the small size of Israel, what might have been operational level influence efforts turn out to be more tactical ones. 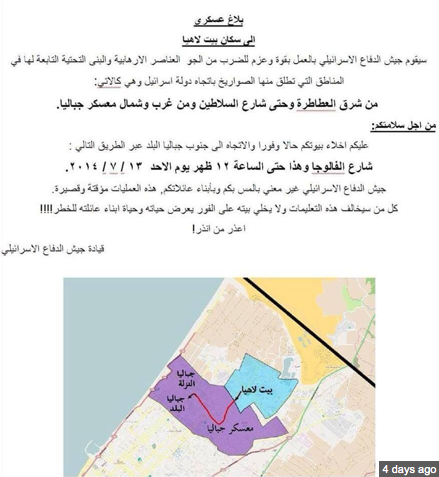 Leaflets and SMS warning Gaza residents of impending attacks and urging them to flee are tactical in nature. Yet the act itself could be considered operational or strategic because of the way it would show the international community that Israel is really the good guy here because it is seeking to avoid collateral injury and death to civilians. 1. Images coupled with music are a good combination and reinforce each other. 2. All influence channels have to work together. While it is fair to say that neither Israel’s Defense Force (IDF) or the Islamic State of Iraq and Greater Syria (ISIS) or Hamas do not have the separation of Public Affairs and MISO that the US and others have, during active conflict all elements need to work together. 3. Knowing the communications landscape is key. Use of SMS is vital in densely populated areas. 4. Traditional techniques may have side effects. While one may debate the use of leaflets as a MISO tool, there can be no doubt of the psychological effect of thousands of pieces of paper streaming down from aircraft. The implication is control of the sky and ability to drop more lethal ordnance from aircraft. 5. Language is key. You use your language, your enemy’s language and English to reach the world media. 6. While Internet exposure may not impact tactical operations, the internet facilitates global influence. The Middle East conflicts are an on-going laboratory for PSYOP and MISO. Readers should be aware of these activities and store them away for training or other lessons learned activity. If there are readers who speak either Arabic or Hebrew, I’d appreciate knowing how the English differs from those two languages. As always, reader comments encouraged. A second instance took place about a year later at Fort Hunter Liggett during another AT exercise. I was sound asleep when the CQ woke me up. “Sir, the BC is on the field phone and wants to talk to you now!” I stumbled out of bed to learn that the unit missed its radio check, so I had to amble down to the radio and do it myself. The point is that basics are important. I have been a Red Cross volunteer on and off for a number of years. My specialty was Public Affairs. Ever since I passed my Ham Radio license test in November I’ve been retraining in the networking, computer operations and radio communication specialty. This week finds me in San Diego (there are worse places to be) for three days of hands on training. 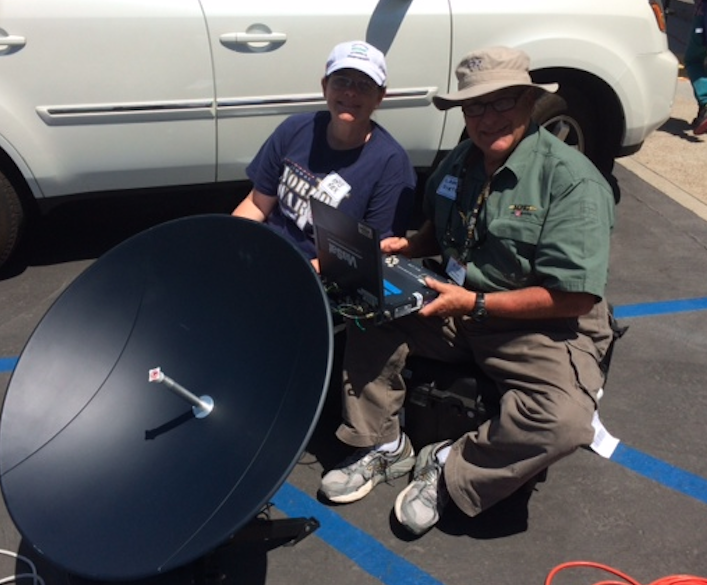 The highlight of Day 1 was learning how to set up a VSAT dish and being able to connect to it as a means of getting out to the Internet. We also learned about setting up switches, VOIP phones and wireless access points. Azmith, aps and elevation are all components of the process. These are hard skills on finite hardware and software. So, how does one go about staying fully competent in PSYOP/MISO which is a mix of ‘hard’ and ‘soft’ skills. I’d offer a couple of suggestions. First of all, be aware of the news and see if you can figure out the next sh*thole where troops will be deployed. Try to experience different cultures. Find ethnic neighborhoods and look around and enjoy a meal at a local place or a coffee/tea. Stay abreast of the latest in technology. My battle scars from Windows and my relative successes with Apple pushed me over into the world of IMac and MacBookAir, not to mention iPhone and iPad. Each of these technologies requires practice and labor intensive organization. Working with photos, videos and social networking sites also requires a fair bit of effort. I must admit that I was given a Samsung phone to set up as home work this evening and while I got some stuff done, I couldn’t get passed the incomprehensible instructions for e-mail authentication so that aps could be loaded. There is no end to what you can do to keep sharp. The key is to consistently do something challenging.